Donald Contreras sounded as if he had won the lottery as he described the before-and-after pictures of his recent home renovations. It took the Canyon Corridor resident three years to afford a new air conditioner that already was 25 years old. And since his house on 28th Drive was built in 1952, new windows, exterior paint and a renovated block wall were desperately needed. Even after selling his camping trailer and an old organ, the money needed for windows alone would have taken years to save. That is, until last fall, when he saw a flyer in his mail about a partnership between Habitat for Humanity Central Arizona and Grand Canyon University. Intrigued about the opportunity, Contreras swallowed his pride and asked for help. A few months later, the 12-year resident now has new windows, a freshly painted house and concrete block wall to begin 2017. “My dream came true,” said Contreras, who’s hoping for a quick return visit this year to replace 64-year-old insulation. “It’s like winning a car on a TV show. 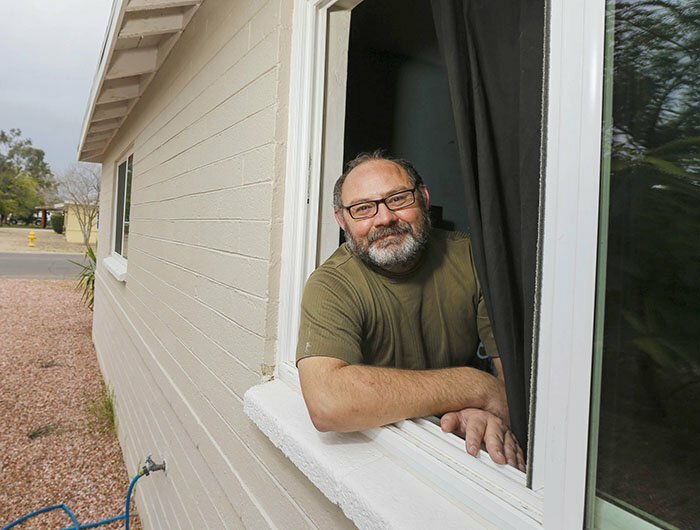 Contreras’ story is one that has played out in several neighborhoods near the University thanks to its Donate to Elevate campaign, which gives GCU employees the option of allocating some of their state tax dollars to specific programs, such as Habitat for Humanity or private school tuition, with no reduction in take-home pay. The University’s goal is to get participation from at least 90 percent of the employees in each department. Departments that have reached the goal will be recognized at the all-employee meeting Friday morning at GCU Arena. GCU’s partnership with Habitat for Humanity is part of President Brian Mueller’s neighborhood revitalization plan that was launched in 2015. The goal is to renovate as many as 700 homes in the Canyon Corridor. Renovation projects include painting, landscaping, roofing, new windows, air conditioning and other structural repairs. Habitat provides the leadership and training, while GCU students and employees provide the volunteer manpower and funding. To date, 1,026 volunteers have contributed 6,521 hours to the Habitat projects. More than 200 repairs have been completed for 105 families, and tangible results can be seen in every nearby neighborhood. One such house belongs to Sharon Malone, a retired educator and a 41-year resident. An “eyesore” that was her exterior was replaced in mid-December with a new paint job for the house and fence plus a new air conditioner. Now that her house has been improved, she has watched her neighbors suddenly start sprucing up their home exteriors, too. Both Contreras and Malone said they hope that more such improvements are on the horizon — and not just because it would raise the value of their homes. Upgrades to people’s lives means upgrading the community’s future, one home at a time. “A huge, huge improvement — I’m so glad they’re there,” Contreras said. “I think it’s going to help the neighborhood, and the program is fantastic.